Cutting down a pine tree can get complicated, depending on the size of the tree and the number of buildings or other trees in the area. Before felling a large pine tree, accurately estimate the height of the tree so you will know where the top of the tree will land when it falls. Take your time estimating the height of the tree--you don't want the top of the tree crashing through your or your neighbor's house or garage. Estimate the height of the pine tree you plan to cut down. Use the estimating tools found in the Resources section. Survey the area around the pine tree you wish to cut. Knowing the height of your tree, measure from its base to the point where the top of the tree will land when the tree falls. Determine safest direction for your tree to fall where it will do the least damage, taking the length of the pine branches into account. Put on a hard hat, gloves, goggles and ear protection. Dampen your chain saw blade with water before you begin cutting to lessen the amount of pine sap that will stick to the blade. Wash your blade with running water after every few cuts to keep the pine sap from sticking. Climb the tree with the help of a climbing harness and use the chain saw to cut off any branches that could cause damage when the tree falls. Position yourself above the branch when you cut it. You should only have to cut a few of the lower branches; the upper branches of a pine tree tend to be shorter that the lower ones and pose less of a problem when the tree falls. Notch the tree on the side facing the direction in which you want it to fall. Make a straight cut into the tree at waist height with your chain saw. The cut should go approximately halfway into the tree. Make a downward cut at a 45-degree angle that goes to the center of the tree and hits your first cut. Knock out the notch with a heavy hammer. The notch should be open in the direction you want the tree to fall. Make a single straight cut on the opposite side of the tree, aimed just above the center of the notch. Just before this cut reaches your notch the tree should begin a slow and graceful fall, falling in the direction of the notch. Move quickly away from the tree as it begins to fall. Get as far away as you can, moving at about a 45-degree angle away from the direction in which the tree is falling. 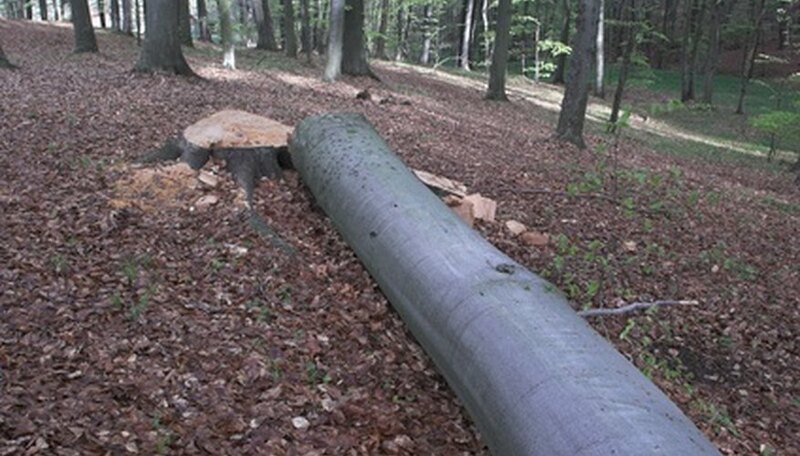 Cut the tree into manageable pieces with your chain saw. Cut the stump down flush with the ground. Measure the height of a tree using the "stick method." Hold a stick in your hand so that a 12-inch length of stick is above your fist and the stick is 12 inches from your eyes. Step back from the tree until the top of the tree appears to be at the same height as the top of your stick. The distance between you and the tree is the height of the tree. Clean tools with rubbing alcohol on a rag immediately after using them. Rubbing alcohol will dissolve pine sap and help keep your tools looking like new. When moving out of the way of your falling pine, do not run directly opposite it. Bits of wood can shoot off in that direction. Instead run away at a 45-degree angle from the fall. Keep children and animals clear of the area where you are felling the pine tree.